Bring a large pot of salted water to a boil, add pasta, and cook according to the package instructions or until al dente. Drain well & return to the pot. In a baking dish/sheet, toss the halved cherry tomatoes with the garlic cloves, dried herbs, salt and pepper.Drizzle olive oil on top of this & mix everything. Pop it in a 350 degree F oven for about 10 minutes until the tomatoes burst open releasing their juices. Cool for a bit. Blend/Puree the roasted tomatoes along with the roasted bell peppers to make a thick sauce. Pour the sauce mixture over the cooked pasta and toss gently a few times.Crumble some Feta cheese over the top, garnish with some herbs and serve hot or cold. Update: I am sending this over to Ruth who hosts the weekly Presto Pasta Nights . Thanks for giving me the opportunity to participate, Ruth. very easy recipe TBC. have bookmarked it. Hi TBC! 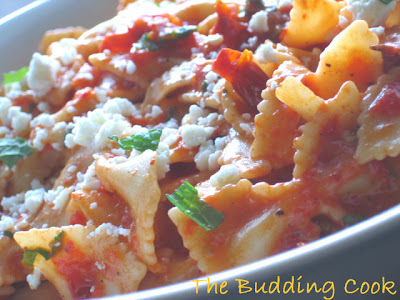 My son loves pasta and I can try this sauce! Your picture is great! What a luscious sauce that is TBC and I'm sure that feta would've been great with the tomatoes. Love it. thanks for ur onam wishes :) i do agree that payasam is not really a popular favourite. and one of these days i really have to try pasta. simply everyone in the food blog world have a dish with pasta. one of these days..
TBC dear, recipe bookmarked, such lovely ingredient,I love feta cheese on top of anything. Will give this a shot,did you used red or green pepper ? the pic looks really nice....love pasta. Sounds delicious. I have some peppers in the fridge, I think I'm going to make this up! Recently I made spaghetti with all veggies roasted - zucchini,bell peppers,onion and garlic, but did not make it into a sauce. I shd try your version, delish! Laavanya, I loved the flavor of the roasted tomatoes , it was soooooo good! Archana, I am sure you will like it. Madhu , yeah simple & bursting with flavors. Asha, thanks:-)You are such a sweetheart. Sreelu, on't add to much feta... I did that and had to take some off the top! I used roasted red bell peppers, the store-bought ones.You could roast your own too. Richa,thanks. Yeah, there sure is, but in this dish, the roasted tomatoes are clearly the " star"
Kanchana,let me know how it turns out if u do make it. I had this last night. I had so many veggies in various stages of decay in the fridge! Cleaned 'em up, chopped 'em up, and threw 'em in a roasting pan with olive oil and some dried basil, oregano, salt and pepper, and shoved 'em in the oven. Boiled the pasta, tossed it together and garnished with feta cheese, and parsley. It was heavenly! Thanks for the feta cheese inspiration. It does look wonderful I'm so glad you decided to share it with Presto Pasta Nights. Check back for the round up tomorrow. Kanchana, thanks for letting me know :-) Glad u liked it. Rachana, thanks... do lemme know how u liked it! Came here from marriedtoadesi.com. Sounds delicious, we are huge pasta-addicts. This is on my to-do list! Akila, thanks for stopping by. Do let me know how you like it when you make it.